3x adopter. 2x children's book author. Kickstarter. Retro camper. Digital pro. 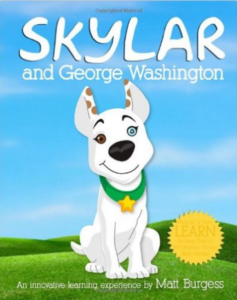 Join a unique puppy named Skylar on her history-making adventure with the greatest American hero. George Washington is brought to life in this innovative picture book from Matt Burgess where charming characters are set into fascinating photographic scenes. Kids will love the rhyming story that moves the story through the entire life of George in 27 large scenes measuring 16 inches wide by 10 inches tall. Young children will engage in word association with colors, sounds and animals. Mature children will engage with more advanced concepts like people, places and dates. Adults will find a special section with quotes, facts and dates that enhance their ability to teach younger readers beyond the main story.